I want to explain a little bit more about what it takes (at least from my perspective!) to get to adulthood. And by the way, I see adulthood as one of the ultimate goals of all people. Not to mention all the benefits it offers, which we looked at in the last article. 2. Modifying current behavior patterns. Once you’ve achieved a certain level of success in these two areas, establishing and enhancing relationships with the other, inner, parts of you naturally follows. Since healing the past is easier, we’ll look there first. Plus, once you’ve dealt with your past, changing your current patterns becomes much easier as well. Just to expand on that last point: yes, I realize you can change your behavior today by making powerful choices. Choice makes it happen. But before you can do that, sometimes you need to make sure you’re standing on firm ground. When too much of ‘you’ gets lost in the past, then it’s like standing on loose sand or gravel. You’re not grounded. And you need something solid to push off from. Anyway, when I first start working with someone, I’m usually going to want to look at their past, to see what lead them to their current state. Even though the past doesn’t create the present, it does create a mighty strong influence! The first thing I’m going to want to know about, is the degree of childhood shame. How badly were you shamed? I do this because often times, parental figures will dump their own shame onto and in to you. And you can’t just ‘process out’ the shame someone dumped on you. You can’t just feel it and release it. You can’t write it out. It’s like you’re stuck with it. That is, until you return it to the offender. And if there’s a lot of shame, then the benefits of returning it will be immense. You do this internally, by the way. Talking to the offender out loud, in person, does little or no good. They wouldn’t know how to take back their shame even if they wanted to. Sometimes, however, the shame is so great that we can’t start working there, and instead we need to work on healing the pain. Other times, the shame is not such an important factor, so we can sort of gloss over it at first. Just depends on the person. After we look at the shame, then we can go one of two ways. Either focus on the past, or work on present behavior. Usually, though, now it’s time to start retrieving power from the past. And here’s where it gets pretty individualized, depending on the person I’m working with. Generally, we’re looking for pockets of unresolved energy. Anything that’s intense, and unresolved, and is in the past. Meaning, it happened before the present moment. It could be 50, 60 years ago, or it could be last week! Usually you’ll find repeatable patterns, rooted in early childhood. It’s like there’s a common thread, or a pathway, or an energy pattern – however you see it; however you term it. The pattern goes from very early childhood, all the way up to today. You could view this pattern as like pearls on a string. Each pearl on the necklace compares to a pocket of unresolved energy. The pocket may be either one singular event, or a bunch of similar events that form a specific pattern. You may eventually find you have, say, fifty different pockets of intense, unresolved energy inside you. Or, maybe you’ve only got a few incidents from the past to reclaim. Either way, you’ll eventually want to go back to all the ones you can find. So it doesn’t matter which incident you start with. They’ll be there for you, when you’re ready! To me, these little pockets seem like buried treasure. A little treasure chest of gold, or a little bag of diamonds, or, sometimes, a pocket of crude oil. In other words, they hold value. They also hold your power. They also, usually, contain lost parts of your consciousness. They listen to the voice of the ‘lesser’ inside them. They don’t want to do the work to heal, until the least of them approves. Which never happens, by the way. My job involves gently guiding people to the places that scare them inside. And convincing them they have nothing to fear. Quite the contrary, in fact. They have quite a bit to gain. If you had a five year old daughter trapped down a dark well, would you be too scared to help her get out? Would the pain of her being down there prevent you from taking action? Would you be paralyzed, incapable of action? Or would you do whatever it takes to get her out? Or would you listen to your ego? It’s kind of an absurd example, but it applies here. Sure, there is no flesh and blood child at stake. It’s only an inner, invisible child. You may or may not even believe you have an inner child who’s alive right now. And even if you do, so what? That’s all buried in the past. It doesn’t matter now. And I would remind you, you’re always standing on some sort of foundation. It helps to know what’s in that foundation, to make sure it supports you. If there’s any type of pain in your life… then, obviously, the pain comes from something in your foundation. Anyway, the process involves going to each individual pearl on the string; each unresolved pocket, and soaking up the energy that’s there. It may also involve returning any shame, if any, that may be there. Obviously, emotions will come up as you do this. Your job is to feel whatever’s there. Fear, anger, hurt, whatever. Feel the energy as cleanly as you can. Meaning, just feel what comes up, without any rationalization or justification or blame or excuses. Just feel! You reclaim the energy. Period. In addition to soaking up the juice out of these pockets of unresolved energy, you’ll also want to establish or enhance your relationship with your inner child and inner adolescent. You’ll find you can go back and talk to these parts of you, and help them heal their pain. You can even teach them healing techniques. 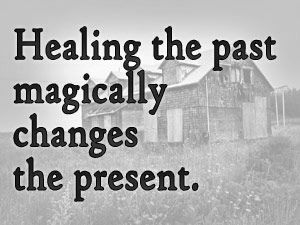 As you might imagine, I’m a bit obsessed with healing my past… To me, it’s fun. And the rewards are immense. So, in a nutshell, that’s how I help people heal the pain as they retrieve their lost power from their past. It’s not the only way to heal the pain, and it’s not the only way to resolve the past, but it’s one way. If you want to talk about any of this privately, just contact me. In a future article, I’ll go over some of the ways to work with current behavior patterns. Thank You Very Much For Sending Me This Article. People Can Learn A Lot From It. I Know I Can! I think we are genetic seeds that have a natural pattern of ‘unfolding’ as we grow. Part of the unfolding is that from the earliest we make ‘maps’ to try and understand the world around us. Maps are not reality – just our current understanding of it. But if, as young children, the maps we draw for ourselves show the world as threatening, and our role in it as shameful, we feel terrible shame and fear. And there we can stay stuck, with these balls or unresolved energy as you call them, as I well know, unless we are able to replace the maps we drew as children with more accurate ones through revisiting areas our maps tell us are full of danger and pain. Easier said than done. There is so much confusion and hurt surrounding this I admire you greatly for your courage and intelligence in healing yourself and your generosity in using your understanding to help others. Just happened to check my Email and when I saw your Healing from the past, it was like it was meant for me. The more I read, the more I saw myself in this. I had a terrible childhood and it carried me in today Adult hood up to today. We think it will all go away, but continues to come back. Your an amazing Man Mark, where are you located, and how do you work with People concerning their issues? I always look forward to your readings, but todays heal your past, was definitely meant for me. I find your writtings very practical and to the point. years of experience have nothing to say? reasonable explanation to our behaviour and thinking. consider other perspective as well (including their own conditioning). I agree that it’s a very complex situation. And, ultimately, it does come down to the choices we make. The thing is, most people don’t function as an adult – they function as some other part of themselves, such as the child or the ego. And I’ve been as guilty of this as anybody. So please don’t think I’m pointing the finger at anybody – this is just my observation. I understand, we do spend a lot of time trying to figure things out. But I don’t necessarily see that as ‘adult behavior’ – mostly it’s a way to attempt to control things in our life. And it’s a way to avoid feeling our feelings. Been reading a few of your articles over the last few months and have been printing out some of them like Path to Adulthood – healing pain to be able to re-read and journal about what comes up. I’m also giving some excerpted copies to friends and my therapist to read. Thanks for all the effort you put into these!